for learning through art and play. We offer a preschool alternative for children ages 2.5-4.5. Since November of 2015, Story Tree Play Group, has offered a small class size experience for children in a unique, peaceful, nurturing and aesthetically charged environment. The Willow Nest Studio space has been carefully designed with young children in mind, thoughtfully outfitted with a materials lab, an extensive children's library, and moveable spaces for light and shadow play and fort building. It also provides room for theatric arts and movement, art centers for paint and clay, spaces for loose parts constructions, and a fort for cozy, restful comfort. The space is open and full of transformative possibility. Located on the second floor of a sunlit studio, on a beautiful tree-lined street in Windsor Terrace, and across the street from Prospect Park, children are cared for and inspired within the studio's nest walls, as well as shepherded safely into the park for forested, nature walks and playful explorations in the great outdoors. The path to the beautiful meadow across the street is just a few minute's walk. Outdoor play is an integral part of the program and happens every day that weather permits. Our philosophy is child-centered, holistic and inquiry based. 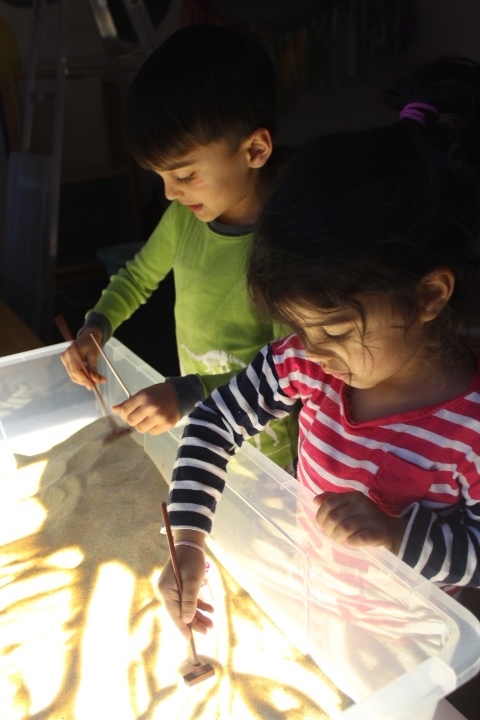 We believe that children thrive when given permission to explore sensory rich materials, to direct their own learning, and to share their thoughts and feelings. Guided play, provided by caring, interested and listening adults, lies at the heart of our practice. We know that every child is unique and filled with potential and therefore we focus our attention on children's strengths. Our teachers are fun and dedicated to making the learning experience a positive one for every child. We are influenced by the Reggio-Emilia approach, the play theories of Lev Vygotsky and many other leaders in the importance of play and the multi-modal arts in early-childhood development. These approaches aim to help children develop a sense of self and the executive functioning skills fundamental to becoming life-long learners. At Willow Nest Studio, children develop their potentials and skills needed for school readiness in a holistic way. It is our goal to serve the whole being of each child so that he/she may be helped to grow their potentials as innovative thinkers and caring citizens of the world. We are opening our doors for Open Play Workshops and are currently accepting playgroup applications. To learn more about what we do, and to receive the latest information as it becomes available, we encourage you to join our mailing list. Willow Nest Studio, Inc. is privately owned and insured. We hold a Group Family Daycare License through the New York State Office of Children and Family Services. We integrate: visual arts, music, creative movement, dramatic story play, puppetry, light and shadow theater, nature and science exploration, sensory play, adventures in group planning and social skill development. © 2015 All content is the property of Willow Nest Studio, Inc. please contact us for permission to reuse any content.